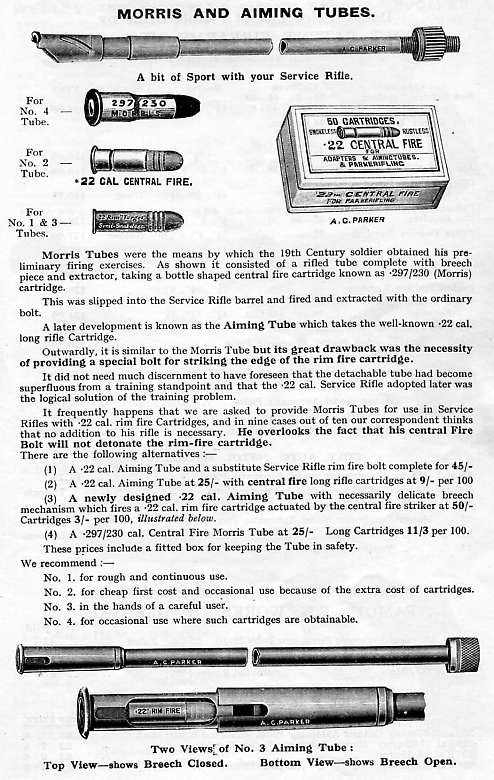 "BACK FROM THE WAR "
The War Department's " List of Changes in British War Material" (LoC - 4452) show the date of approval for introduction of the first aiming tube - for the Martini Henry .577/450 rifle - as 14th. November 1883. 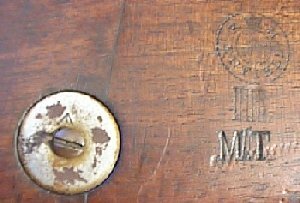 The patent for the devive had been applied for by the inventor, Richard Morris, on the 25th. of April 1881; application no. 1773. 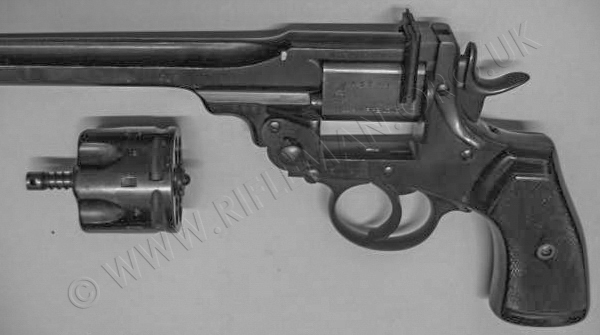 The equipment was officially described as " Tube, Aiming, Morris's, Martini-Henry Rifle, (Mark I) "
There are advertisements and references to be found for the use of the Morris Tube in the Snider conversions ( the first British breech-loading service rifle to be introduced) of the Pattern '53 (1853) Enfield rifled musket, itself the first generally issued rifled (muzzle-loading)British service long-arm. 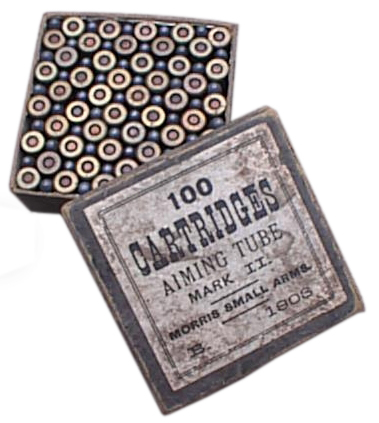 When the Martini-Henry rifles were converted to .303CF (Centre Fire), initially with Metford rifled barrels and latterly with Enfield rifling, aiming tubes were introduced for the adaption of those full-bore rifles to the Morris .297/230 miniature cartridge for training purposes. 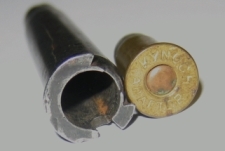 These tubes were necessarily thin-walled compared with the original aiming tube for the .450 Henry barrel. 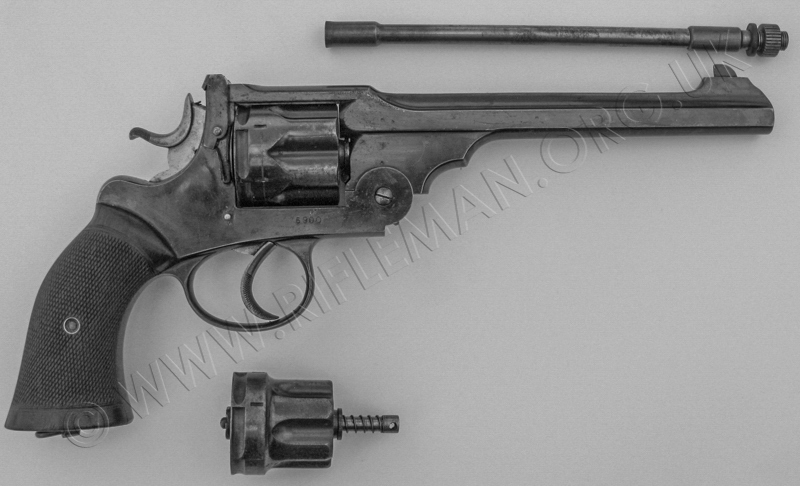 A single-shot adapter unit was produced by Webly and Scott for their own revolvers. That illustrated below is fitted to a .455 calibre "WS" Target Model, first shown with the removed .455 cylinder alongside. 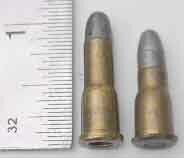 The unit is shown below prior to fitment, with a .455 wadcutter target round and a .22RF long-rifle cartridge. 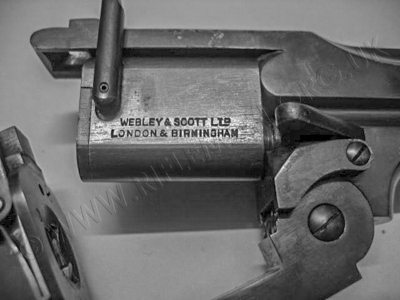 The Webley manufactured adaptor can now be viewed from both sides, with its manufacturer and proof marks. 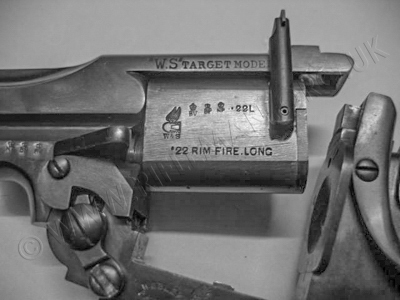 These adapters were on offer from 1925 right through to 1939, and could early on also be purchased in .297/.230" "Morris" centre-fire calibre. Also in 1939, Parker-Hale advertised an almost identical unit supposedly of their own manufacture. Post WW2 only the six-shot adapter unit, covered next on this page, remained available. A.T.C. 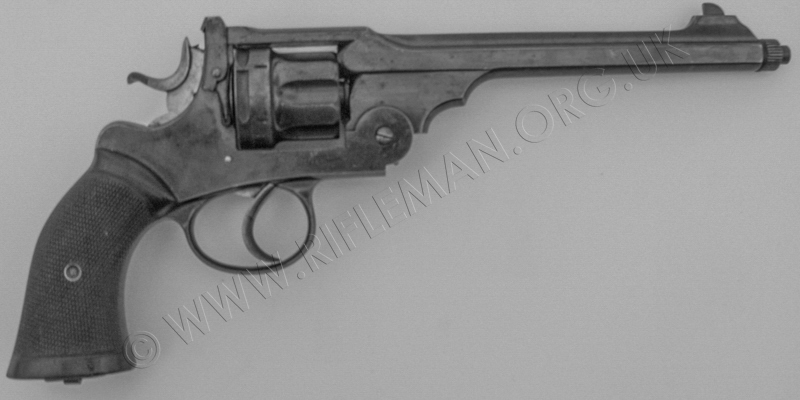 Hale and A.G. Parker collectively applied for a patent for their six-shot adapter unit for the .455" calibre service revolver in January 1923.
but the six-shot version was marketed both pre and post WW2, with the advertisement remaining unchanged. In all those years, the only alterations to the appropriate page in their catalogues were the updating of testimonials for the adapter - and the price. 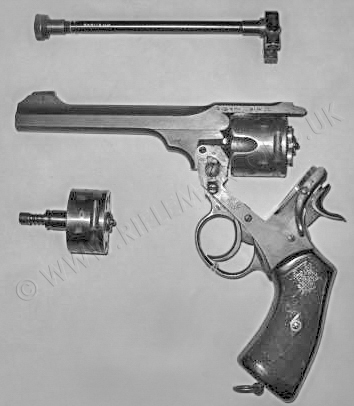 The need for such a sub-calibre service revolver adapter was perceived by an army officer at the Hythe School of Musketry, Captain W.E. Robinson (not to be confused with E.H. Robinson, the co-author of the fine reference book "Rifles and Ammunition, and winner of the King's Prize in 1923). At W.E. 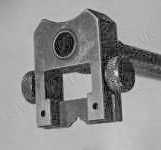 Robinson's instigation, the design for the device was embarked upon by Arthur Hale and Alfred Parker. The Patent application, No.210,270, is shown below. as for the rifle Aiming Tubes shown at the head of this page. 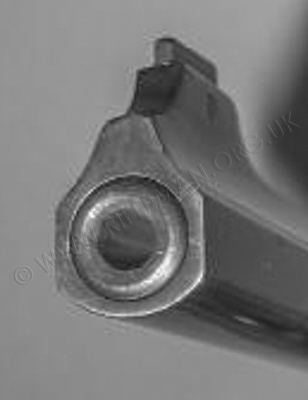 Below is the Morris tube adapter shown alongside its Webley "WG" parent arm. 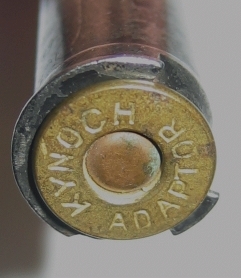 Unlike the .22RF six-shot adapter, the Morris Tube is a separate tube with a chamber section that slides into the .455" chamber of the revolver's barrel, and protrudes beyond the muzzle with a threaded section that carries a knurled bronze nut that tightens against the revolver muzzle - pulling the Morris chamber firmly into the .455 chamber - and damped by a leather washer. Only firm finger pressure is required to hold the tube in place. The .22RF six-shot adapter tube requires no protrusion beyond the revolver muzzle, and is held in place by a breech-piece located in front of the reduced-lenght .22RF cylinder. 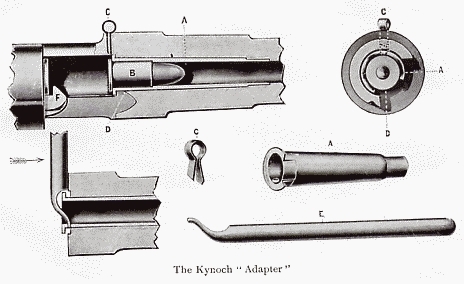 The Morris adapter uses a full length cylinder, which is reduced in diameter for the forward two-thirds of its length, leaving just the indexing rear section at full diameter. 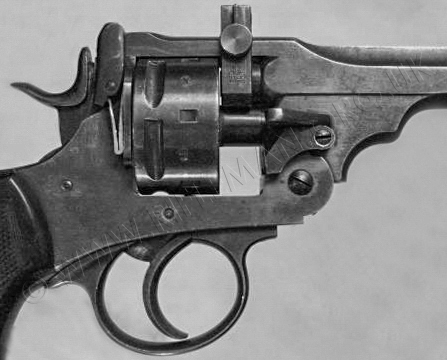 It is presumed that this is for the combined reasons of keeping the weight and balance of the revolver as near as possible to that of the parent service arm, whilst also providing an obvious alteration in appearance between the revolver in its two alternate configurations. Below, the "W.G." is shown with the adapter fitted. 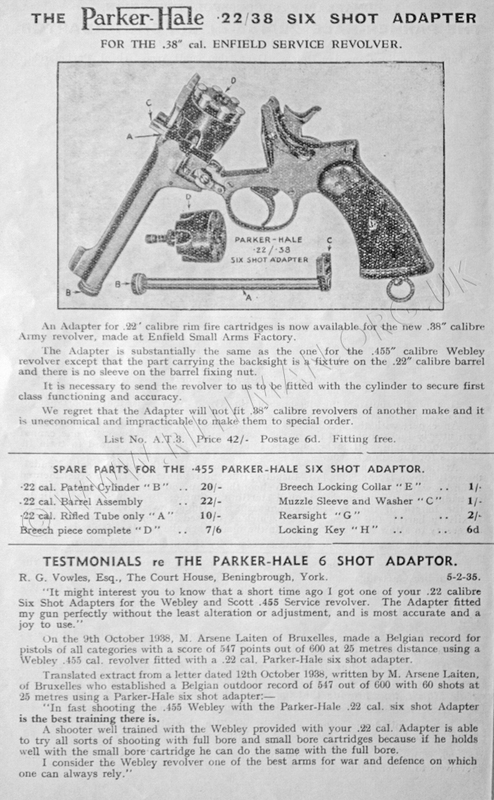 The Parker-Hale adapters provided a far more economical proposition, than did specialist permanently converted or factory option miniature-calibre revolvers, for those already in possession of service models, with the six-shot models for the .455" Webley Mk.VI and Enfield .38/200, each costing only £2:2:0 - two guineas. The single-shot version for the Mk.VI was just £1:16:0. 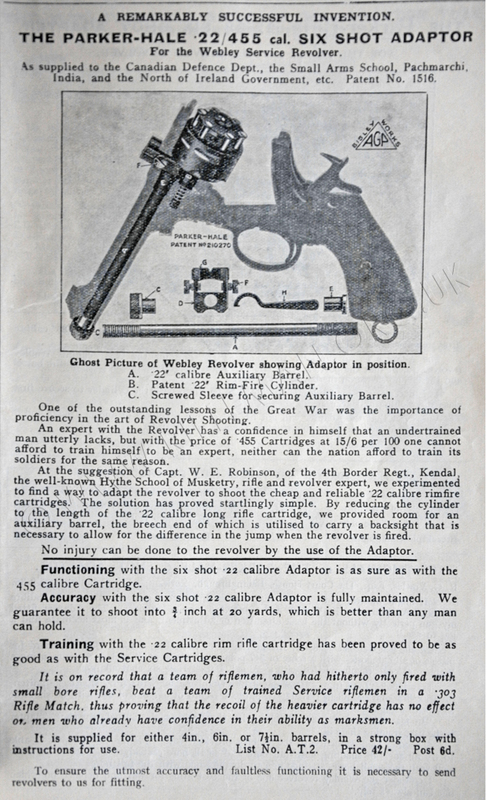 Unlike the more usual situation pertaining today, the 6-shot adapters were being sold in 1939 at a figure nine shillings less than that being charged in 1925; which significant reduction was presumably connected with production matters relating to supply and demand. As an approximate guide to today's equivalents, one guinea was then one pound and one shilling, being the contemporary of the 21st. Century £1.05. At today's valuation, this would rate at approximately fifty-three times as much. 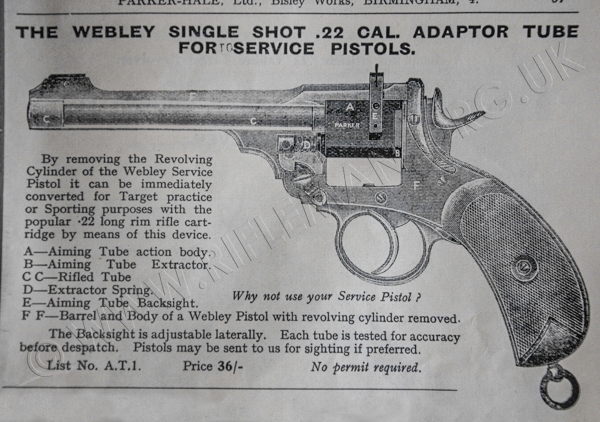 Below is the catalogue page advertising the six-shot adapter for the Enfield No.2 Mk.1 revolver. the first image being of the opened pistol with the kit adjacent prior to the cylinder swap and .22 barrel insertion. Next, the rimfire cylinder and .22RF tube insert are in place. 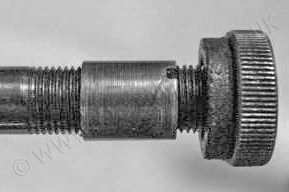 and the threaded sharp end of the .22 barrel tube, showing the .455 sleeved collar, the knurled tightening knob with its leather washer. The clever concept permitted semi-automatic use of a sub-calibre round in a full-bore pistol, carbine or rifle. 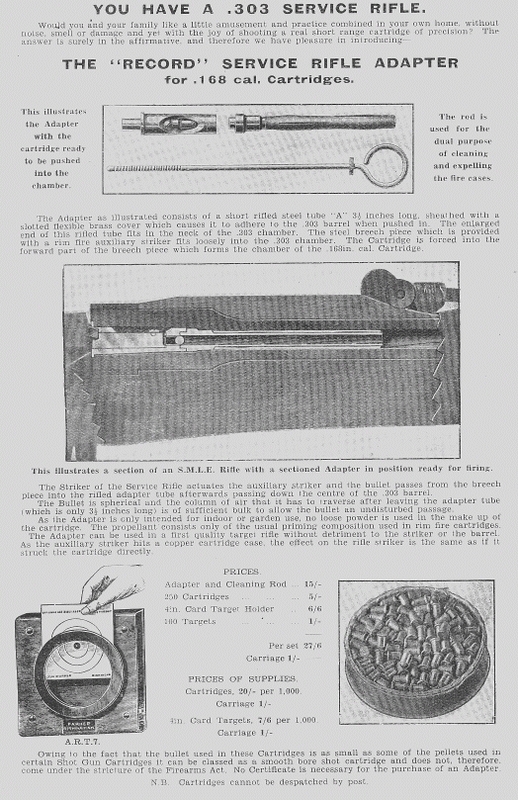 The sliding chamber section imparted energy, acquired from the recoil of the firing of the under full-size round, to action the weapon - at the same time generating a sensation, for the shooter, more akin to that of a larger calibre round being fired. 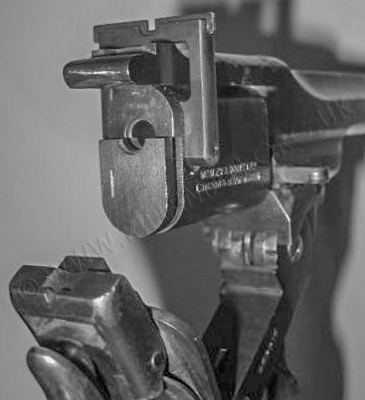 This particular unit is not strictly under the remit of these pages, not being a rifle adapter, but it is a remarkable design and worthy of mention - and is is also believed later used for training on sub-machine weaponry and certainly on the Browning Machine Gun. The floating chamber principle, was the invention of Marshall Williams, who devised it whilst serving a sentence in a United States penitentiary for an offence committed during the days of Prohibition.